Mark is a 15 year police veteran, with the last 12 years employed by the Springfield Missouri Police Department. Mark has been a member of the Special Response Team for 9 years, the last 5 being assigned to the full time element. He is the teams primary Tactical Breacher and has over 600 operational breaches. Mark is a Missouri POST Generalist Instructor, Tactical Breacher Instructor Trainer, Explosive Breacher, Rappel Master, Firearms Instructor and Armorer. Greg is an eleven year veteran with a state law enforcement agency. He served as point man and entry team leader during his eight year assignment with SWAT. He is currently assigned to the criminal interdiction unit. Greg is an instructor in patrol rifle, ballistic shield, breaching, vehicle stop tactics and force-on-force training. Officer Trusler has been a police officer since 1995 and was hired by the Springfield, MO Police Department in 2002. Prior to moving to Springfield, Officer Trusler obtained a bachelor’s degree in the Administration of Justice from the University of Missouri at Kansas City. While with the Springfield Police Department Officer Trusler served in uniform patrol, DWI special enforcement squad where he was certified as a D.R.E., community services section as a bicycle patrol officer at the Missouri State University Campus sub-station and was selected to be a part of the Special Response Team in 2005. In 2006, Officer Trusler was selected to the SRT Marksman/Observer Team, completing the intermediate and advanced sniper schools at Springfield PD. Officer Trusler has attended various sniper schools to include a “Shooting through Glass” course at the National Tactical Officers Association conference in 2009. Officer Trusler has been deployed as an M/O in all types of tactical situations since 2006 with approximately 75 deployments. Officer Trusler has served as assistant and lead instructor in sniper schools since 2007 for Springfield Officers and various state, county and federal agencies. Officer Trusler is a member of the American Sniper Association and has been an instructor since 2010 for the Kansas City Metro Tactical Officers Association Camp Dodge Advanced SWAT Training held at Camp Dodge, IA. In 2009 Officer Trusler was selected to the Springfield SRT Full Time Team where he currently serves as the M/O Coordinator, responsible for training and is the team’s point man. Officer Trusler has been responsible for the monthly training and deployment readiness of the 10 M/O’s assigned to the team since 2009. Officer Trusler has been a Missouri P.O.S.T. certified generalist instructor and firearms instructor. Brandon has been in law enforcement for 12 years and is currently a sergeant with a state law enforcement agency. 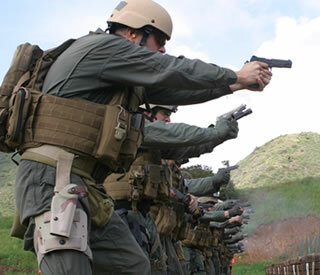 He is assigned to the agencies Training Division where he serves as a firearms instructor. In addition, Brandon has been a member of the agencies SWAT team for 10 years.